This month was rough money-wise, but great life-wise. You win some, you lose some, right? With a baby arriving, I have been going a little overboard buying things that I hope will make life easier. We’ve also had a slew of doctors bills, which I’m sure is only the tip of the iceberg of what is about to come our way. At the same time, Jordan and I have clearly been trying to live our best lives before we are faced with less freedom. This has included a lot of nights on the town, which has been less than comfortable as I waddle my way around London. But even with the added expense and the discomfort of maternity jeans (seriously, who created these things? ), it’s been completely worth it. While we haven’t been super responsible with our cash as of late, it has made me even more thankful for the system we set up years ago to manage our money. It’s not perfect, but it’s the perfect solution for us. 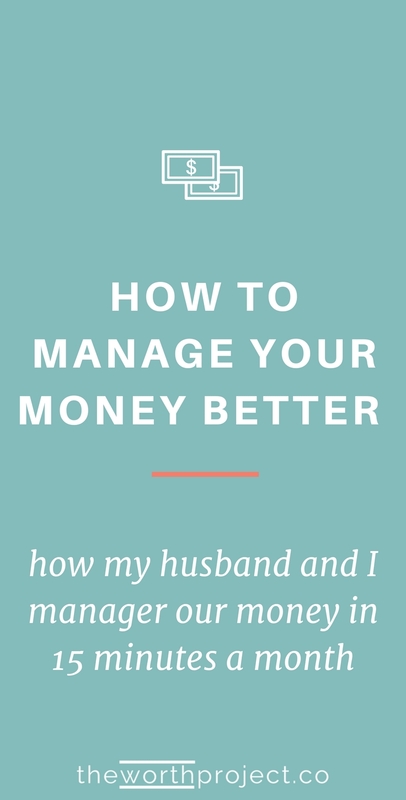 And as life gets more hectic I know that Jordan and I will want to spend less and less time with the day to day management of our money and more time living life (or trying to get sleep – I hear that’s not easy when you have a newborn). 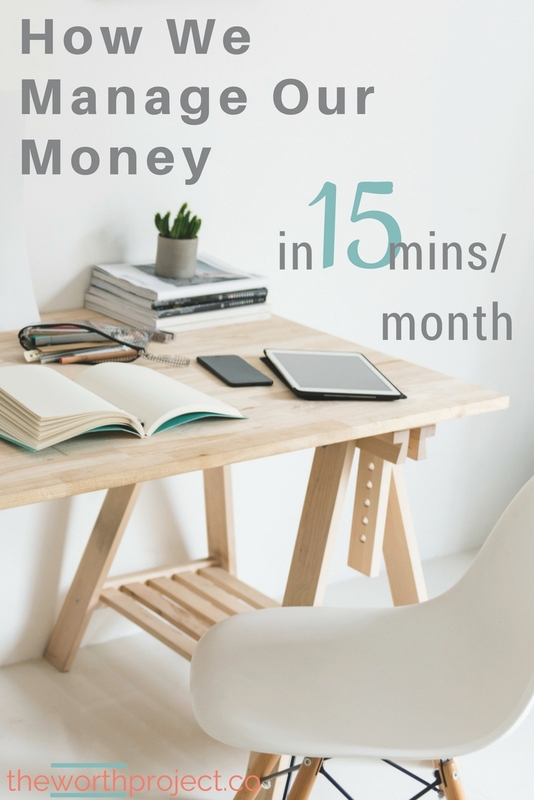 I’ve talked about how we set up our money automatically with the no-budget, budget and we keep it organized with Personal Capital and the spreadsheet in the “Get it Together” guide in the toolbox, but I’ve never really shared what we do each month to keep things in check. This month was one of those months where we had to spend a little extra effort on our end of month check-in. It still only took 15 minutes and we feel like we have our life back in control. Ok, we feel like we have our money life back in control. The rest of our life? We’re pretty screwed. We live off the rest of this spending money for the remainder of the month without tracking spending buckets or budgets (ie: we don’t have a “grocery” or “eating out” category). Once this was all set up, the monthly check-ins are 15 minutes. 15 minutes per month to leave us feeling like totally responsible adults. Fraud, obvi. While banks and credit card companies do try to flag fraudulent transactions, you don’t want to log into your account 3 months from now and find that you have $-8,427 because some creep has been borrowing your account number and spending your cash. Was our spending out of line? We do a once over on our account and look at all transactions trying to assess whether we spent on the things that made us happiest. Or did we have one too many mediocre late night take out runs? It happens and when it does, we course correct for the next month. Helpful tip: if you’d rather track your cash more closely, you can use Mint or Personal Capital to review all of your transactions by category at the end of the month. Unexpected things do pop up. Like this month. Not only did we have a lot of extra expenditures (I regret nothing! ), we also had some unexpected bills that we forgot to save for (hi, HOA dues). When unexpected things pop up, like they did this month, we make a note of them and figure out if we need to make adjustments to our monthly transfers. We like to give ourselves a little pat on the back when we’ve done something good – like transferring money to savings and investing. While our savings and investment transfers happen automatically, we take a little peek into our accounts to make sure they all arrived safely and then marvel at the fact that our balance is growing. 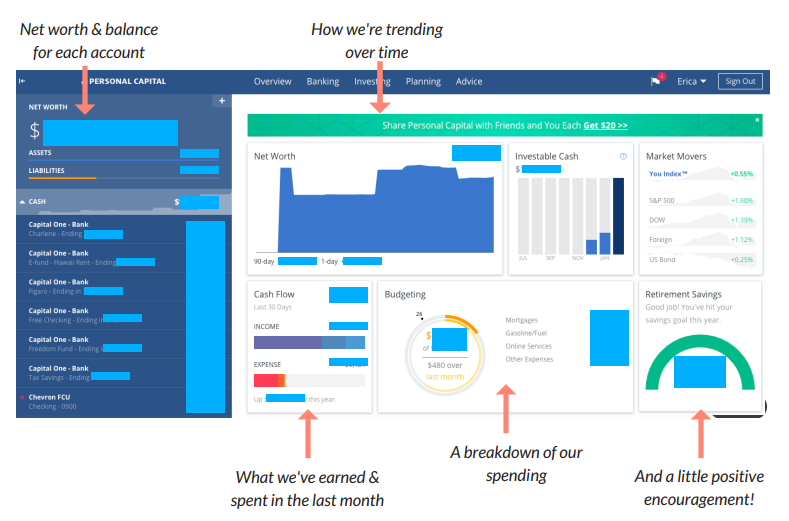 We do an overall check through our Personal Capital dashboard (screenshot below). We’ll check in on all of our bank account balances and see what’s happened over the last month. We can click on any bank account to see the transactions for the month. If anything looks out of whack, we’ll log into our actual bank account to check it out. This happens every few months, but we will have an irregular bill pop up, like home insurance. I usually pop a reminder in my calendar so I’m alerted a week before it’s due. We make sure those bills get paid. Most of the time, using the no budget, budget system we’ve set up paying these irregular bills is a breeze. We’ve been saving for these bills automatically over the months so when our property tax bill comes in, we have money sitting in a savings account ready and waiting to make that payment. For example, if our property tax was $6,000 per year, we’d set up a transfer of $500 per month into a savings account labeled “property tax.” When the bill comes in we’d take the money from that account and pay it. Easy. But there are those times when we get surprised by a bill, like what happened this month. We purchased a property last year and there are annual HOA dues that we owe. Last year we paid them right around the time we bought the property, so the fact that this was an annual payment got lost in the details. We didn’t set up a bank account for a monthly transfer to take cover this bill. This year, we just had the bill arrive and we didn’t have the cash earmarked to pay it. We had to (annoyingly) take money out of a different savings account to pay it. Lesson learned. Every once in a while we’ll need to adjust our goals and transfers. This happens because we forget about a bill – like our HOA dues – or because our goals have changed. For example, we’re almost done saving for our f-it Fund. As soon as we hit our goal, we’ll stop that automatic transfer and figure out what we want to do next with that cash that was part of the automatic monthly transfer. Making these changes is so much easier and faster when we have the spreadsheet filled out from the “Get it Together” guide from the toolbox. You can read more about that process in this article. There’s always something around the corner, right? That’s what makes life exciting. It might be that we have a trip coming up that we need to book travel for, or that we have a new opportunity with work. Lately, it’s been a little less exciting as we’ve been talking about childcare options and what we’re going to spend (ugh). But soon that discussion will just be part of our automatic bill pay each month in step 1…I hope. If we need to talk about anything with our computers out and our accounts up, this is our chance to do it. Having a system that is easy and a monthly check-in that is quick has made being responsible for our cash so much easier. We don’t have the time – or the patience – to pour over details every month and with this, in place, we know that everything is taken care of, seamlessly. Get it Together Guide: to keep your money organized. Really. 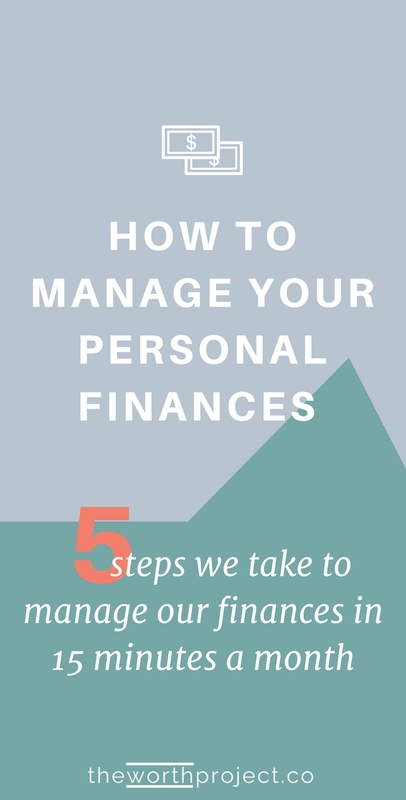 Thanks for all the wonderful advice – its been super helpful in planning my post-law school finances. I’m going to move to London after graduation and was wondering what banks or strategies you recommend for a US expat living in the UK. I hope to eventually move back to California but not for sometime if that is at all relevant. Hi Jacquie! Exciting that you’ll be relocating to London – it’s an amazing place to live. I actually have received this question a lot so I’m planning to do a full post. I haven’t loved any bank here, to be honest, so I don’t have a good one to suggest. Though I will say it is helpful to use a bank that is global (like HSBC) so you can connect a US checking account and a UK checking account – it helps just to have your money all in one place where you can see it all. BUT I do love Transferwise for sending money between the US and UK. It’s much cheaper than any bank out there. It’s really helpful when you have obligations in the US that you need to pay (I had student loans to be paid). We also use US brokerages for our investments since we know we’ll move home eventually. Using Transferwise to move money for our investments is a big help as well. Good luck with the move and I plan to have a full expat post up this summer!